or business, your papers need a place to go or you will get STUCK. That leads to procrastination (fear). The definition of Procrastination: The practice of carrying out less urgent tasks in preference to more urgent ones, or doing more pleasurable things in place of less pleasurable ones, and thus putting off impending tasks to a later time, sometimes to the “last minute” or not at all. How frustrating – and the head space it takes up can be debilitating. InTip 1, I talked about sorting through papers on your desk. By now, you should have a pile of file folders on the right side of your desk and on the left side you have a pile of papers that have not yet been folderized. Take the top paper; does it fit into any category – can you determine if there are other papers that would fit the description… If so, make a file folder and put it off to the right with the other file folders you’ve made. Continue to do that for each paper. Do you really need to keep it? If the answer is no, shred them or recycle. I know many people that save papers because they don’t know what to do with them. Think it through. I shred things all the time. Practically everything is now available online. Once you’ve gone through those papers and have made files, we will go on to Tip 4. Stay tuned. Organization, organization, organization!! I’ll just keep telling myself that and reminding myself of your great tips! I may also be buying a new shredder in the near future. Organization makes all the difference! And putting those papers away is a big part of that. 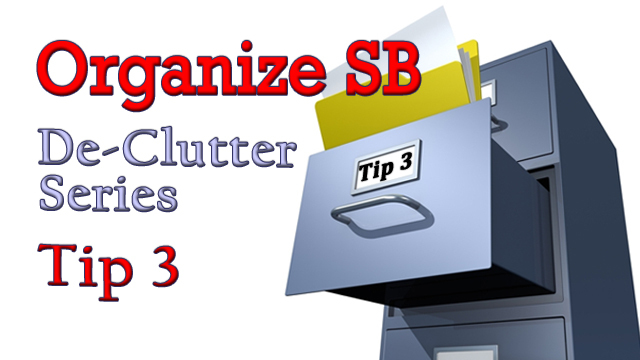 Cindy, these practical tips to help folks conquer the clutter are invaluable~thanks! Having less paper around is very helpful, thank you! I’m looking forward to your next tip! Thank you Cindy, this is a great series! In my work as an executive and life coach I see, time and time again, the importance of proper organization. I’m looking forward to tip 4! Thanks Cindy. On my next trip to the office supply store, I may be purchasing a bigger, better, faster shredder.